Tracy Vaughn thought she knew her limitations as an artist. Although she plays the flute and sings in a choir, in the visual realm, she says, she couldn’t draw an interesting stick figure. Then she entered a new friend’s house one day and what she saw hanging on the walls amazed her: quilts, in the softest silks and richest velvets, in swirling colors and unusual shapes, quilts just begging to be touched. Walking through that door, she walked into her life as a visual artist, and a maker of dazzling quilts herself. The quilts Vaughn now creates are a feast for the senses. A far cry from the folksy, homespun, patterned quilts of the American frontier, Vaughn’s are made of the finest silks, cottons, wools, and velvets. They are mostly hand-sewn, spontaneous compositions, which Vaughn calls ‘textile versions of jazz.’ The fabrics themselves “speak” to her, suggesting by their color and pattern which piece should go where. For her Northwestern students, they are a tactile connection with an art form that features prominently in the stories of black women. Says Vaughn, “When I began quilting, I noticed that quilts are significant in Toni Morrison’s novels; Nikki Giovanni has a collection of poetry called Quilting the Black-Eyed Pea; and in one of Terry McMillan’s short stories, as the woman continues to miscarry, quilting helps her heal. I introduce my students to quilting through Alice Walker’s short story “Everyday Use,” and display my own quilts for them to see.” In black women’s writing, Vaughn tells us, quilts are often mentioned as a touchstone for history, for home, for comfort. 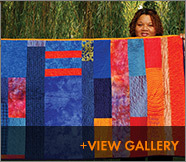 African American quilting reaches almost as far back as the history of colonial America. Slave women on plantations were often needed for spinning, weaving, sewing, and quilting. Some made scrap quilts for their own families with leftover material, discarded clothing, and feed sacks. A highlight of Vaughn’s life as a quilt artist was Toni Morrison’s visit to Northwestern in 2006. Vaughn teaches a Morrison seminar, and after the author’s talk, Vaughn reminded her that all of Morrison’s novels mention quilting. When Morrison asked Vaughn to create a quilt for her, Vaughn was almost speechless. How should she proceed; what should she include? But within the year, she had produced a work of art in which each block of fabric represented in an abstract way one of Morrison’s novels. For Beloved, Vaughn found a fabric with the shadowy image of a woman in the shading of the dye, representing the ghost of the novel. The final block was a portrait of Morrison, for which Vaughn had found a wool yarn flecked with gold and silver, recreating almost perfectly Morrison’s trademark dreadlocks. The quilt was presented during the author’s retirement ceremony from Princeton, at the Lincoln Center in New York. As we spoke with Vaughn this summer, her quilts were already on a plane to her new home on Northwestern’s Qatar campus in Doha, where she will teach literature for the next two years. Vaughn is a newly-wed, and she hopes the quilts will help the new apartment feel like home for her and husband Jesse Manley, a retired Marine officer. She hopes to have an exhibition of her quilts there, as she did at Northwestern’s Dittmar Memorial Gallery two years ago, and perhaps start a quilting group among colleagues and students, as she has at Northwestern.